This page is currently referring to v3.1a, and will be updated with infos for v3.2a at some point, maybe. Refer to the source files if you need to be sure. 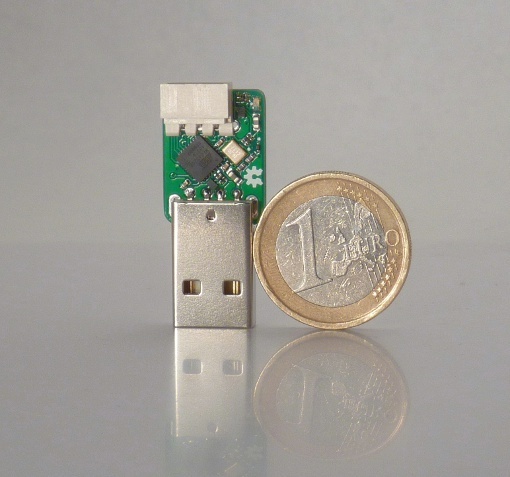 The hardware of the USB2AX is relatively simple: only 17 components and a 15x20mm PCB. At its core is an ATMega32u2, an USB-enabled 8bit MCU with 32KB of FLASH, 1KB of RAM and 1KB of EEPROM, running at 16MHz. The USB2AX v3.1 has a double LED (Red/Green), ESD protection on both connectors (USB and serial), 0.1“ breakout pads for RST, GND, HWB and the 4 SPI pins (PB0 to PB3). To achieve Half-duplex operation on DATA, TX and RX are shorted together and the firmware alternatively turns ON the transmission or reception side of the MCU's UART. This is inspired by the Arbotix.